Less than a month after the September 11 terrorist attacks on the United States, U.S. troops—with support from British, Canadian, French, German and Australian forces—invaded Afghanistan to fight Al Qaeda and the Taliban. More than 17 years later, the Global War on Terrorism initiated by President George W. Bush is truly global, with Americans actively engaged in countering terrorism in 80 nations on six continents." Neat. I didn't realize we had a base in Botswana and were in combat in Tunisia. Assuming this is anywhere close to being accurate, of course. We are not conducting joint exercises with the Iraqis? Nor the Aussies? Hmm--I'm pretty sure there are some photos on the Internet that disprove at least the latter. We're militarily involved in FORTY PERCENT of the world's nations. ?????? And some of you just go "ho-hum" yeah well we have to because you know, there's like evil and stuff all over…"
internal, intellectual,thoughtful introspective garbage that somehow justifies it. 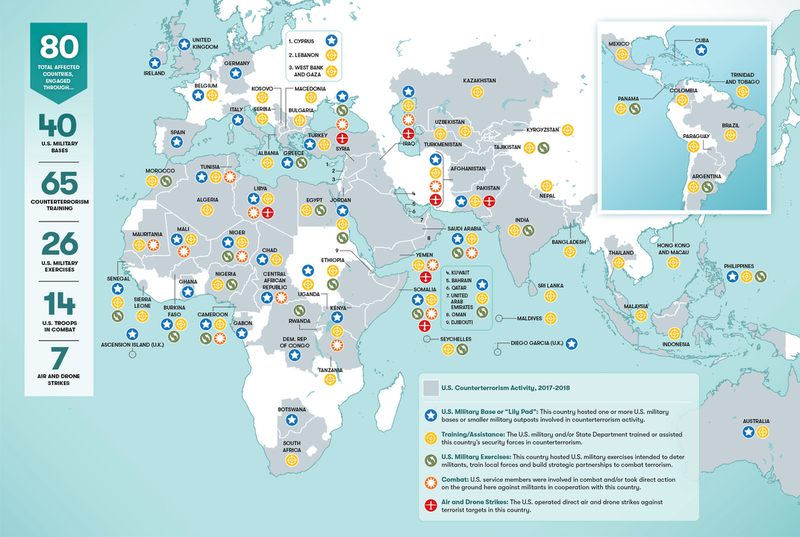 You don't see a possible connection between a nation having 1,000 military bases around the world and engaged directly in seven conflicts while proxying hundreds of others, and the fact that that same nation can't take support its own people economically and can't even maintain its own infrastucture and services??? And you REALLY believe we're in a hundred countries fighting "terrorism"??? Lol. Oh people, just call the U.S. what it is. An EMPIRE! …that's slowly rotting from the inside out.